Saturday, November 18, 7:00 p.m.
On November 6, 1998, gay University of Wyoming student Matthew Shepard left the Fireside Bar with Aaron McKinney and Russell Henderson. The following day he was discovered on a prairie at the edge of town, tied to a fence, brutally beaten, and close to death. Six days later, Matthew Shepard died at Poudre Valley Hospital in Ft. Collins, Colorado. 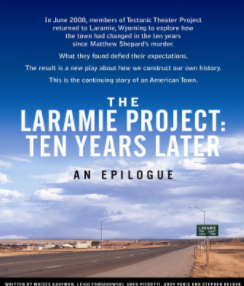 On November 14, 1998, ten members of Tectonic Theatre Project traveled to Laramie, Wyoming and conducted interviews with the people of the town. Over the next year, the company returned to Laramie six times and conducted over 200 interviews. These texts became the basis for the play The Laramie Project. Ten years later, on September 12, 2008, five members of Tectonic returned to Laramie to try to understand the long-term effect of the murder. They found a town wrestling with its legacy and its place in history. In addition to revisiting the folks whose words riveted us in the original play, this time around, the company also spoke with the two murderers, McKinney and Henderson, as well as Matthew's mother, Judy Shepard. THE LARAMIE PROJECT: TEN YEARS LATER is a bold new work, which asks the question, "How does society write its own history?"